I was surprised. I never knew my mother as a dancer until that moment. And now, reflecting back, I’m struck by all the ways that she, indeed, did leap across the stage. She leaped in her professional life as she opened to the world of pre-schoolers on a daily basis. She leaped as she sang in notes so high that none of the rest of us could reach her. She leaped in her cooking – sometimes to her kids’ chagrin. Chocolate chicken, and raw sea urchin, and bread so healthy that it crumbled in our hands. She leaped as she swished that brush across the paper, painting the light and the sea and the frothy waves. She leaped as she sat on the deck and soaked in the day’s sparkle. She leaped, time and again, as she found a way to live within a body that was quietly giving up its outer leap. And, two weeks ago, at age ninety-three, with a dancer’s quiet grace and ease, she slipped right out of that body and leaped into some new adventure. And here I am contemplating leaping. I’ve done my share of leaps as well. Sometimes, I’ve leaped with gusto, off the rocks in Maine and into the chill of the North Atlantic, off the Tarzan swing and into the clear fresh water of Teal Lake in Michigan’s Upper Peninsula, off the thirty foot high platform and into the wild blue yonder at trapeze school. I’ve leaped and I’ve whooped my way into one adventure and then another. I love these grand glorious leaps into the unknown. And I love the quiet leaps that may seem like a limp or a whisper or nothing at all to the outside world. I love leaping my way into a broader perspective. I love feeling my mind leap from idea to idea. I love leaping into a more joyous buoyant way of thinking and being. And now, I’m leaping into something new with my mother. It’s like that when someone you love has left their body; you can’t stay perched on the solid ground of old patterns. My mother no longer answers her phone. And she is nowhere to be found in her earthly dwellings. But I’ve sensed that she is present, known for a while that we would stay connected after her transition. And so, while skate-skiing two days ago, pushing and gliding and thinking about leaping, I spoke to my mother in this new silent kind of call. “Mom,” I said into my mind’s phone, “Mom, help me see the expansive ways that we can leap across this stage.” And, as I skated up hill with these words in my head, as my heart pumped and my breath quickened, something told me to look at the ground in front of me. At first I thought it was a leaf or a twig or needles from a pine nestled in the snow. But it wasn’t. As I skied closer, I saw it clearly. It was some kind of a little box or sign and on its surface were printed in bold red letters the words, “I love you!” I skated on by, happy in this new leap. There are so many ways that we leap across this stage! 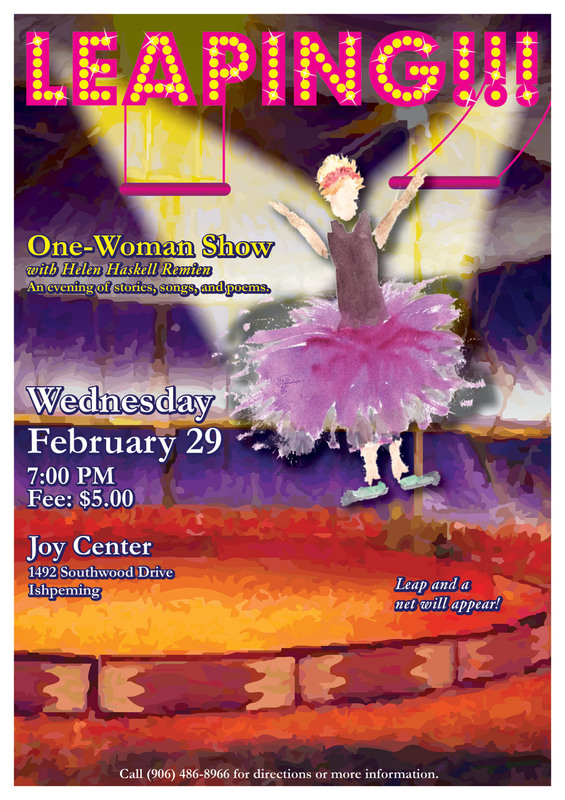 On Wednesday, February 29, Leap Year Day, at 7:00 PM, I will be leaping onto center stage, in a performance at Joy Center. I invite you to come and join in the party. Perhaps you will experience some leaps of your own. And you are always welcome at Joy Center. The next two months of offerings provide a multitude of opportunities for leaping, quiet inner leaps and exuberant outer ones, in yoga and energy and art workshops, in dance and movement sessions, with poetry, writing your own, and listening to the poems of others, at Out Loud where we share our stories, our songs, our poems, our Selves. There are so many ways to leap across the stage and we are always leaping, leaping into the next moment, the next opportunity, the next grand adventure.